an antagonist pursuing the same or different goal that crosses and blocks the protagonist. So the story is a series of escalating battles between the protagonist and the antagonist in pursuit of their goal(s) that ends in a final battle from which only one emerges the winner. The problem is that the longer the protagonist pursues the goal, the longer the story runs, and the more sag it develops as the pursuit is stretched out, leading the reader to tire of the chase and ask “Are we there yet? But if you can turn the story in a new direction with higher stakes, essentially beginning a new story that’s a more exciting continuation of the old, the reader is hooked again and digs deeper into the narrative. Or to go back to “Are we there yet?”, it’s two hundred miles to Grandma’s house. At the sixty mile mark, we stop for lunch. At the hundred and ten mile mark, we stop for ice cream. At the hundred and sixty mile mark, we stop for the zoo. And at two hundred miles, we arrive at Grandma’s. We started out going to Grandma’s house and we ended at Grandma’s house (we kept the same overall goal) but along the way things happened that were interesting and made the ride seem brand new each time we got back in the car again. But that example isn’t quite right either, because each turning point not only refreshes the reader and sends him or her off on a new trip, it also increases the stakes and the tension. So for that, think of each turning point as the place where you shift the plot car you’re driving into a higher gear until you’re going flat out full power into the climax. The Struggle Begins: The Protagonist is living in her normal world when something happens, preferably on the first page, that turns her life around and starts her battle with the antagonist. Then at about 30% of the story in . . . The First Complication (or First Turning Point) turns the story in a new direction again, raising the stakes because of the new information, new pressure to fight back. Then at about 55% of the story in . . . The Point of No Return (or Second Turning Point) turns the story in a new direction again, and this time the impact is so great that the protagonist changes so much (has changed so much over the first half of the book due to her struggle) that she can’t go back to where she was before. Then at about 80% of the story in . . . The Crisis or Dark Moment (or Third Turning Point) turns the story in a new direction again, almost defeating the protagonist, making her revise everything she’s learned as she symbolically goes to hell and then rises again at the end of the story or . . . The Climax or The Final Battle (or Fourth Turning Point) when the story turns once more, ending with the protagonist in a new but stable situation. Obviously those percentages are completely optional, as are the number of turning points. (Actually, everything is completely optional; it’s your book, you can write it any way you want.) But as a tool for revising a sagging plot, turning points that are spaced so that they grow closer together with each turn will increase the pace of a story while also increasing the pressure on a protagonist. 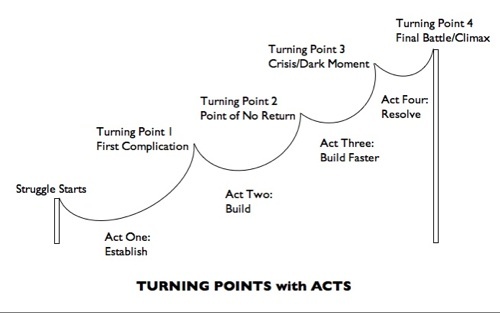 Finally in between those turning points are acts, big chunks of story that create the anticipation (audiences like to guess what’s going to happen next) of a probable outcome and that then surprise the audience and reverse the anticipation at the turning point. Each act also raises stakes, forces the protagonist to take greater and greater actions in pursuit of her goal, and shows evidence that the protagonist is changing (aka character arc). Turning points should be used as a tool to shape a rough first draft or to solve pacing problems or to give you a way to stand back from your story and analyze it. They’re tools, not rules. Use what works for you and discard the rest. Next > Super-Special-Secret Educational Opportunity Now Half Off! Thanks for posting this! Your talk was fantastic, and the clothesline analogy finally made it all sink in. Thank you for the info, handy to have. I wish I could have been there to hear you. Do you mind questions from the audience even at this late date? A concrete example would be helpful for me to see if I have this right. So I’d like to take a look at Faking It from this paradigm. Is this how you would break it down? The Climax: Showdown at Mason’s house. I’ll have to go back and look at Faking It since it’s been so long. One problem with using that book is that I started it in the wrong place. The story starts when the protagonist acts, pushes back against the antagonist. So if Tilda hadn’t gotten in the car and gone home to get the Scarlet back, Nadine selling the painting wouldn’t have started the story. It’s Tilda’s act against Clea and Mason that begins the story. Which happens AFTER the first scene. Faking It originally started in the closet, but that was too late a start, so I moved it back to Tilda finding out about the sale and telling Gwen that she’d be home to fix it. That was too early a start and because of that Faking It begins very slowly. It should have started in the gallery when Tilda says, “Here’s what we’re going to do,” but by the time I figured that out, Steve was part of the story and she gets Steve in that first scene. So I left it as it was which was a big mistake because that woman who gets so much page time in the first scene is never heard from again. That’s a big clue that the scene is unnecessary. I could have gotten Steve in there another way. Well . . . how can I argue with a writer about her own book? But, that woman was very vivid for me, and as a result of her, I had no problem with Tilda wanting to give up the job and stop being a Fake Painter. It’s true you (the author) were explaining stuff to me (the reader), but it was plenty entertaining, and I really needed that stuff later. She kind of foreshadowed Clea, too, for people who hadn’t met Clea in Temptation. (-: You know what, though? If you wanted to re-write the book, I would buy it. It would be fascinating to see what Now-Jenny has to say, especially compared to Then-Jenny. But I suspect that’s entirely too much to ask for. I’m looking forward to the .pdf. I tried to make notes while you were speaking and I was scribbling down page numbers. It’s less confusing as shown above. Your workshop was the most helpful. You were the most dynamic speaker and easiest to follow, even without a handout. In my office, I have the clothes line with what needs to happen where. It helped me organize the mess my WIP has become. It also helped me see how I could fix things before the point of no return. Best of all, it helped motivate me to write. I no longer see tackling the monstrosity I built as unmanageable. Looking at it terms of turning points lets me see it in much more manageable chunks. Taking this down to the scene level and looking at the beats has made for a much cleaner story. I am loving Dogs and Goddesses. I really enjoyed your talk. Reading through this really solidifies the ideas and points for me. Thanks so much! Wow. That analysis of the start of “Faking It” really nailed it for me. I have never understood before why when I need a comfort reread (my favorite way to de-stress -sort of like meditation for most people) and I almost never pick FI, and I either read the first scene and stop, or I start after the first scene. haha. you’re ok. scum would be if you never put it up in any format ever – after saying you would. Its thought-provoking. Thanks. I was late to the talk (an agent appt. time) and then had to stand behind a pillar. Then I got a coughing atack and had to scoot outside (inhaled the juice from my chewing gum, I know, I know, never chew gum in class) anyway, I got some of the talk but not all. Thanks so much for taking the time to do this. You’re a genius and now I totally get this (where as in the past I only sorta did) thank you, thank you. Thank you for sharing with those of us who couldn’t make it to Nationals. And maybe this is an annoying question (I’m never sure, but I figure it can’t hurt to ask) but are you still planning on publishing a book on writing? I find your advice particularly helpful when I’m planning my own attack on a story, and would love to have my pocket Crusie to carry around in case of emergencies. Not sure if it’s appropriate to ask here, but thought I’d give it a shot anyway. Bob and I were going to do one together, but that’s not going to work out mainly because the book I want to write is more personal than analytical. We’re not fighting, we just have really, really different approaches. I’m not sure when mine will be done, but I plan on starting it as soon as AKMG is done and I’ve got a good head start on my next fiction project. You know what would be cool? Companion books. And then everyone you’ve ever collaborated could do one, and all of your sales would be boosted by the next one and the next one (-:. It could be a whole network of writing books . . . .
Ahh, I think I should have picked someone else’s book to analyze but I wanted to pick my favorite of yours. But, really, it’s harder to step back from your own work so I should have picked something more neutral. Maybe (hint, hint) when you work up the pdf you could include an example. Although maybe that’s just my concrete self talking and all you analytical types go “Ah, ha” without the example. I will never read in quite the same innocence again due to your post. So, thanks, I think. I took your innocence? Now there’s gonna be talk. Struggle begins: Maddie reaches under the front seat and finds out her husband is cheating on her. Goal: To keep her daughter safe by saving her marriage. Turning Pt: Finding out that her husband plans to take her daughter out of the country. Goal: To keep her daughter safe by guarding her from her husband. Point of No Return: Her husband’s body turns up and she’s the prime suspect. Goal: To stay out of jail so she can protect her daughter and keep her safe. Crisis: Her daughter goes missing. Goal: Find and protect her daughter. Climax: Antagonist is leaving town, leaving Maddie to take the rap. Goal: To capture/accuse/prove the antagonist guilty so that her daughter’s life won’t be disrupted. Wow. I loved Tell Me Lies. And, yes, you stole my innocence too, but I think it’s even more fun to know what’s working and why. Have you always written with turning points in mind, or would you say that a particualar story was one that solidified the idea for you? THANK YOU, thank you! I was about to ask if you would pretty please set the TPs in context. This spells out perfectly what the “handout” above gives us in theory. Innocence: that’s a great analogy! It reminds me of the people in my college English classes that shouldn’t have been there. You could tell because they would say things like, “But I don’t want to analyze everything so much. I just want to enjoy it!” It always astonished me. I really, truly have nothing against people who want to read that way– my mom does, and she’s an avid reader and loves the books she reads. But then those people shouldn’t have been taking a 200-level English class. People who say things like that might as well be complaining that we stole their innocence. We probably did! Oops. I get that the first scene in FI was a no-no of sorts, but I’m glad it was there. It set up how miserable the murals were making Tilda and how trapped she felt. I liked having the flavor of that before we met the rest of the Goodnight clan. I liked it, too. That was the problem. Faulkner said “Kill all your darlings” for a reason. It’s not painful cutting bad scenes. I loved that scene. But I shoulda cut it. That first scene in FI could’ve made a great prologue. That’s the problem. It WAS a prologue, I just didn’t realize it. It’s the stuff that happened before the story started. (-: I know I’m not going to change any minds, but Richard Yates (? )’s “A Good School” had a foreword that was extremely useful. And I think “A Persian Bride” could have used a much longer, explicit prologue, because when he’s writing as an 18-year-old, things are very scattered and confusing (which is what you’d expect from an 18-year-old, but it was pretty hard to slog through, trying to fit the puzzle pieces together). For every good prologue I’ve read, though, I’ve probably read five crappy ones that I could skim through and not have missed. Thanks for the analysis of TML. It is too hot here to think hard enough to try analyzing any more but once it cools off, I’m there. I wonder how this applies to the short story. (-: I guess I’ll find out this afternoon. Right now, I think Struggle and First Complication are going to be bang-bang right on each others’ heels. Thanks so much for the inspiring post! Micki, a short story is written in fewer scenes (yes, I know, duh) so the end of each scene may be a turning point. And there’s no rule that says you need five turning points; a short story might have three (inciting incident, point of no return, climax). Also, as always, if this stuff doesn’t work for you, just discard it and go on. There are many roads to Oz, yadda yadda. Katie, I know people who title each act as if it were its own book. I remember when we were doing Agnes and the Hitman, the title of the third act (the one following Agnes’s meltdown on the lawn) was “Agnes Unleashed” because that’s the act she went nuts in. And thank you all for the much appreciated compliments, especially about the presentation in DC. SO glad to know it was useful. (-: Thanks. No Excuses. Don’t Look Down. (Even though I just discovered someone is releasing a DVD called “Aliens in the Attic” and here I am, writing about aliens in the basement. I won’t think about it. Power On!) I do think the five points will work very well for this — one of those crazy co-incidences of finding just what you need at the very moment you need it (-:. Thanks again. Like, dude, I am so geeking out right now! I had a thought about this question of where the story begins. Maybe it’s the first scene that couldn’t be much different and leave you with the same story. Maddie has to find the underwear; Tilda doesn’t have to be painting the mural. What do you think? A fan all the way from Belfast! Just came across site when browsing for more j.crusie books to fill my summer hols (im a teacher so lots of days to fill!) and realised I have read them all but have lost (more likely lent and not got back) Bet Me and Faking it and theyre out of print here in the UK! Have ordered from amazon marketplace! My fave book is Welcome to Temptation – always thought it would make a great movie! The Dempseys (and the gorg Phin) are great characters, did you ever consider an Amy and Wes book or a Return to Temptation (not like the movie in the book! or maybe..) ie: Sophie and Phin part 2?! Cant wait for the next book, thank-you for all the great characters so far and a great website too. This workshop was the single most useful thing I took away from the convention–even more so than the two editor requests for fulls, since whether or not those work out, my writing will be permanently improved from what I learned. In fact, I had originally planned to come home and just send out my 2 mss, and ended up doing major surgery on #2 because of what I learned in your workshop. [I did a beat analysis, and any scene where I had a note that read: “action?” got slashed. That scene where everyone sat around and ate dinner is history :-)] Hopefully, it is a much better book now. I think it is very generous of Jenny to share the details of her writing processes and concepts in the way she does. Knowing how she approaches her work enriches our perceptions and enjoyment of the results. I can see the logic of this particular structure, based on the framework of turning points, though the lesson I would draw from it if I wrote fiction would not be that this is the only right, or necessarily even the best, structure, but that some kind of rational underlying structure is vital in any serious writing for publication, however dry and factual. The one thing that never works well is lack of structure. I won’t get into the ‘prologue’ argument again (unless anyone invites me to, of course! ), except to say again, ‘I LIKE prologues.